If you were to dump me in a huge mud pit right now, I would not be happy. One, I'd still have to get home and I'm sure my fellow Metro riders would be none too pleased. Two, I'm wearing the same shoes I wore for my wedding. I'd really like to keep them nice. But if you give me a chance to get ready, I'd happily jump into a mud pit. Last Saturday, Blake and I did just that. In fact, we jumped and ran and walked into several mud pits. The week Blake and I got engaged, I did a Tough Mudder with some friends from church. Sure, I had to walk a lot of it and skipped a few obstacles because my ankles just aren't awesome, but I did it and I still feel like a total rockstar for it. Unfortunately, Blake didn't get to do it with us because the event had sold out before we'd even met. He did support me though and he's a rockstar for that. 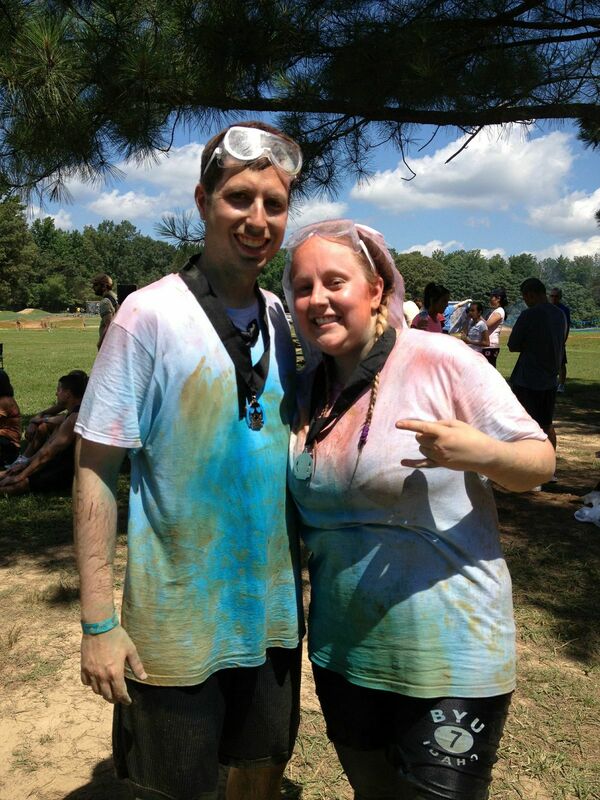 So this last Saturday, we finally got to do a mud run together! This time it was the Armageddon Ambush, a 5K. We dressed up a little - we bought matching white t-shirts (these shirts were clean when we started, folks) and put a bow tie on his shirt and I wore a makeshift veil on my head. 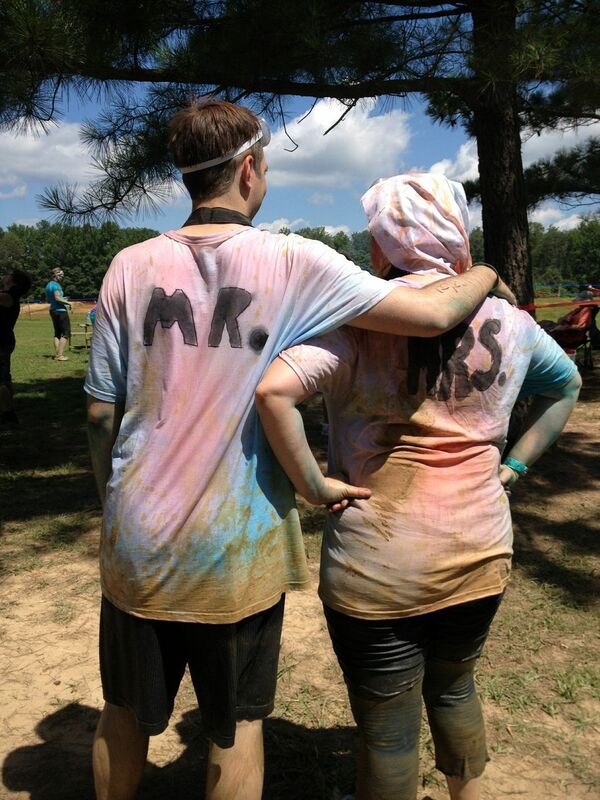 On the back of our shirts were Mr. and Mrs. They were cheap costumes to put together and ultimately destroy. We got several congratulations along the route and really enjoyed playing up our newlyweddedness. I did say we destroyed our shirts though right, because we totally did. The course was a modified motocross race course, so we were up and down a lot of little hills or moguls or whatever dirt bikers call them. We also climbed up and down cargo nets, jumped over a burning log, climbed over and under walls and logs, and slogged through a lot of mud. We ran a little, but mostly walked so I didn't roll an ankle. 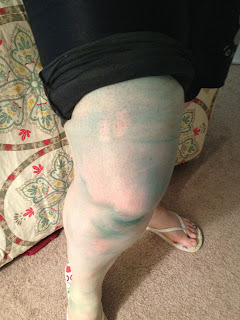 Every so often, we were ambushed by people hurling colored chalk on us, including someone with a fire extinguisher full of blue powder. Between the water and sweat, we got dyed fun colors pretty fast. 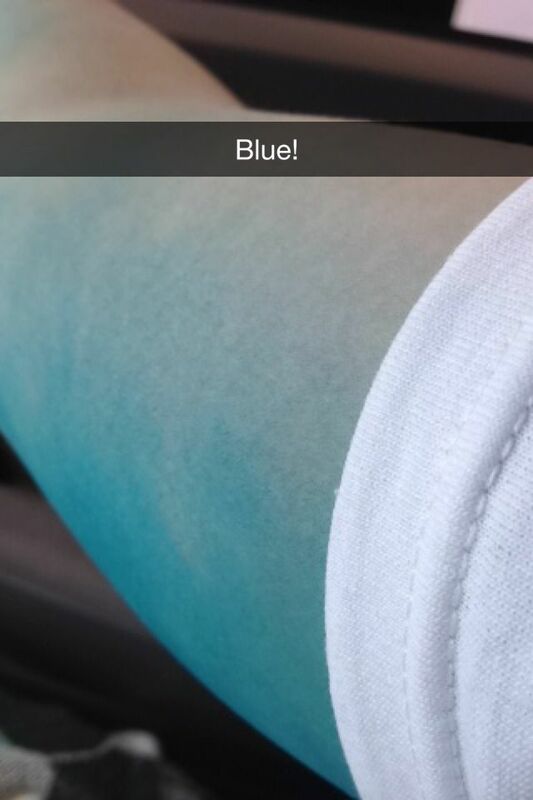 In fact, parts of me are still blue despite multiple showers and scrubs. I also still have a couple of wicked bruises. Our favorite obstacle was climbing a cargo net attached to two shipping containers stacked on top of each other. On the other side was a water slide into a big, muddy water pool you had to swim out of. Blake decided to follow me, rather than climb side by side, so when the other girl and I were halfway up, the volunteer at the top told the one at the bottom to not send anyone else up. After a bit of confusion as to whether those of us on the net should finish or go back down, we decided to finish. The other girl reached the top first and the volunteer helped her get on top of the containers. I then watched them both go down the slide while I hung at the top of this pretty tall net all by myself. While I probably could have gotten to the top alone, I really wanted a spotter and I communicated with the volunteer at the bottom that the other guy had disappeared and I could use some help. Before he could even finish the question of who wanted to go up and help, Blake was a third of the way up the net and the crowd behind us yelled "Mr!" He scrambled to the top, helped me up, we kissed, the crowd cheered, and we went down the slide together. Overall, I liked the length of this versus the Tough Mudder, particularly because of my aforementioned ankles. The rest of the day we were tired, but not totally wiped out, because we accomplished something difficult. The obstacles were mostly overs rather than a mix of overs and unders, but that's okay. We had a really good time and plan to do another one soon!